With so many brands and models of espresso machines out there, it is probably not so easy for you to determine which ones are the best espresso machines under 200 dollars. If you are like most people, you want the best machine available within your budget. Your price limit of $200 says a lot about you – it’s a smart choice and I tell you why! The best espresso machine under $200 is a well-built and functional machine that is able to brew you a delicious shot of espresso with a luscious layer of Crema on top. And that all without the complicated features of the more expensive machines. Those premium features are either simply not available at this price level or only appreciated by the baristas in the coffee shops or at a later time when you become a real espresso fanatic - in the positive way, of course. 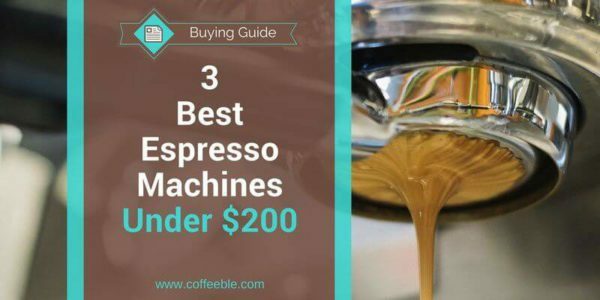 To make your buying decision easier, I have carefully reviewed and selected the three best espresso machines under $200! And if you only want to compare the facts, the table below of the top rated espresso machines should be your next step! Furthermore, you can find helpful explanations about the content below the table in case you need more information. In semi-automatic espresso machines you need to grind your coffee beans, fill the portafilter and tamp it. You start AND stop the espresso brewing process but you don't have to worry about pump pressure or anything. ​That's why it is called semi, since you are only dealing with half of the stuff. Again you grind your own beans and fill the portafilter.​ But with full-automatic espresso machines you only start the brewing process. The machine will stop automatically after a set time. These espresso machines force the heated water with a pump through the grinds. The pressure is much stronger as it is with steam machines. Hence, the espresso tastes much better and you get a thicker crema. Water is heated until it comes to a boil to produce steam. The steam creates the pressure to force water through the coffee grounds. These machines are cheaper than pump driven machines but have disadvantages: less crema because of lower pressure for example. Or eventually bitter espresso, since boiling temperature (to create the steam) is too high for a perfect espresso. Easy Serve Espresso Pods or E.S.E Pods are tea bag sized prepacked espresso shots. Espresso machines must be E.S.E compatible and come with a special filter basket which is placed inside the portafilter. Very convenient, but lower in quality than freshly ground espresso beans. Most espresso machines are equipped with a steam wand. But you have to manually froth the milk and then pour it into the espresso to create coffee drinks like Cappuccinos. Some espresso machines have an integrated milk tank which automatically creates froth and pours it into the brewed espresso. With these machines, you can select Cappuccinos or Lattes with the push of a button. The best espresso can only be created with freshly ground beans. All espresso machines with grinder built-in should come with a burr grinder. Blade grinders are not able to create a consistent and fine enough grind for espresso machines. I know you have set yourself a budget but still demand the best! Therefore, I have carefully selected the three best espresso machines under $200. No matter which espresso machine you will choose – the DeLonghi, Mr. Coffee or Espressione – all three make delicious, rich espresso and thus qualify to be the top espresso machines within your price limit. As a result, you can decide for or against a machine based on special features, like the milk tank, E.S.E support or something completely different. Ask yourself, what is the key feature for your final buying decision? Now it’s time for you to decide! Tell me, what is in your opinion the best espresso machine under 200 dollars and why? Please leave a comment below!